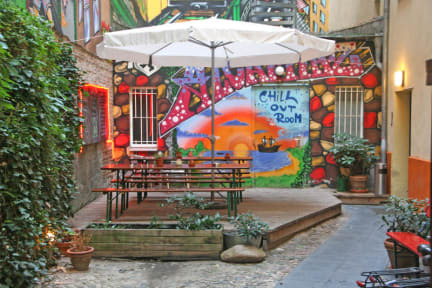 Alcatraz Backpacker Hostel i Berlin, Tyskland : Boka nu! Thank you very much for your booking! Your rooms will be ready for check-in from 3 p.m. Should you arrive earlier, feel free to ask for our luggage -room! Should you plan to arrive later than 6 p.m. at our hostel, please inform us in advance. At check-in, we will ask you for your identification-card number, please make sure you have a valid ID with you! The check-out time on the day of your departure is 11 a.m. Should you plan to leave us later than that, again you may use our luggage-room, of course completely free of charge! Have a safe journey to Berlin! The alcatraz backpacker hostel - central, individual, affordable. The house was colorfully decorated by local graffiti artists and is a popular photo opportunity both for passers-by and our guests alike. Just around the corner from us you may find cosy coffee shops, trendy designer stores, old fashioned record shops, second hand clothing and lots of low-priced restaurants to feast on either asian, italian, arabic or german food. The ideal starting point for sightseeing, shopping and nightlife! - 10 minutes by tram you may find the Wall Documentary Center. A very informative exhibition of pictures, videos and other information about the division of Berlin and what it meant for the city of Berlin. You can see the original parts of the Berlin Wall as well as the death-strip including watch-towers, all rebuild within the city. - 10 minutes (or 3 stops) by underground line 2 you will reach Alexanderplatz with its famous, huge television tower that can be seen basically from everywhere in the city. Find lots of shopping opportunities here. At Alexanderplatz the district of Mitte begins, with all main points of interest to be reached within walking distance from here. For example, the Nicolaiviertel is the historical center of Berlin. This is basically where the story of Berlin began (go here and eat Eisbein mit Erbspueree, you won't find any other food which is more typical to Berlin than this!). But also Museum-Island (with its famous Pergamon-Museum), the Opera-House, Gendarmenmarkt, Friedrichstrasse, the Brandenburger Tor, the Reichstag or the Holocaust-Memorial can all be reached by foot from Alexanderplatz! Ask us, and we will tell you even more points of interest in Berlin!